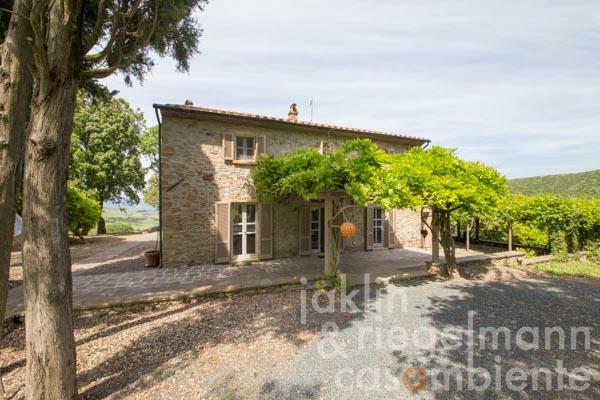 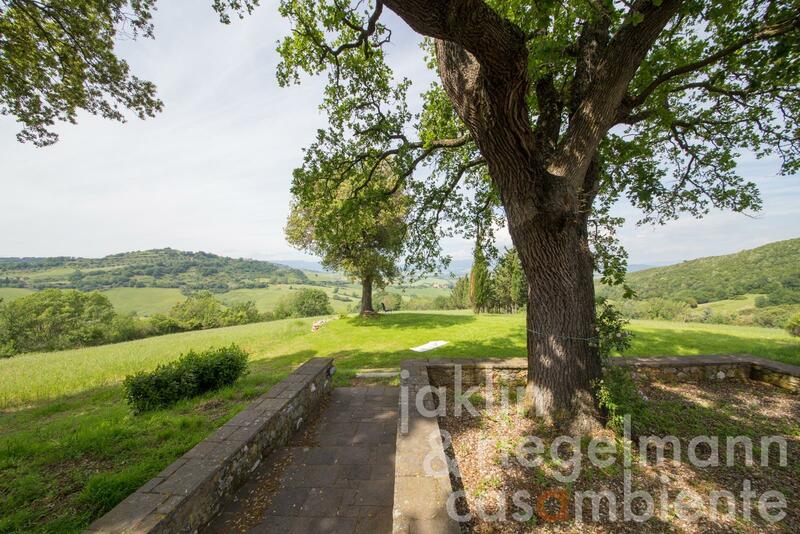 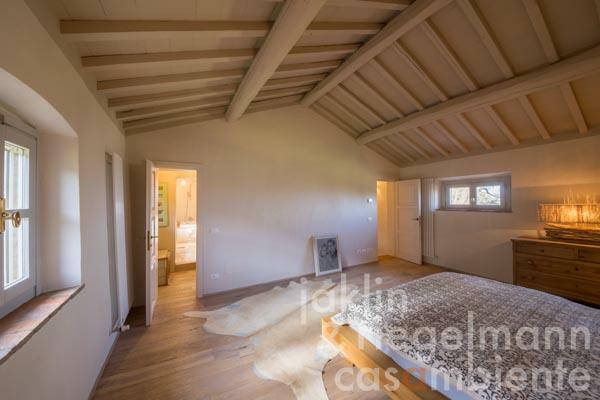 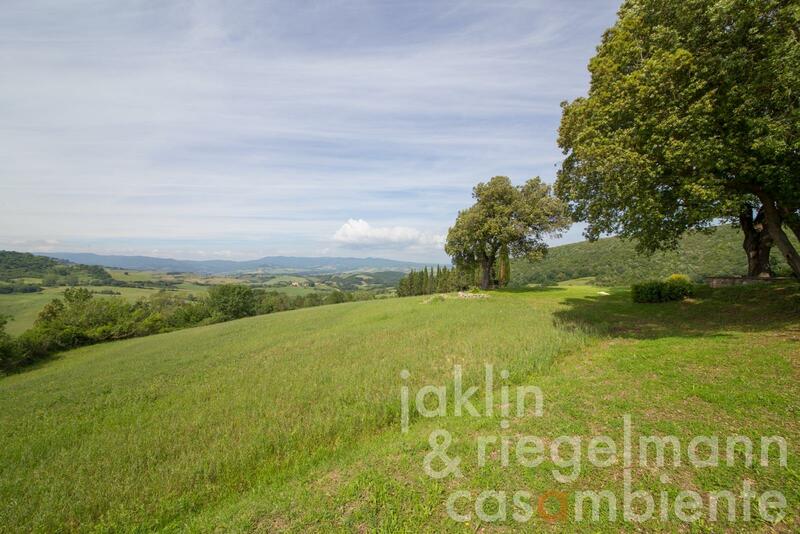 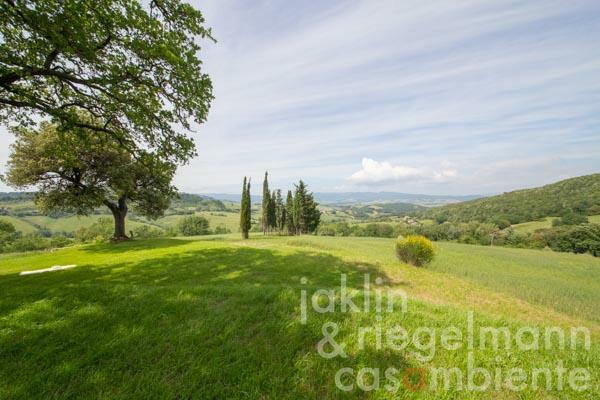 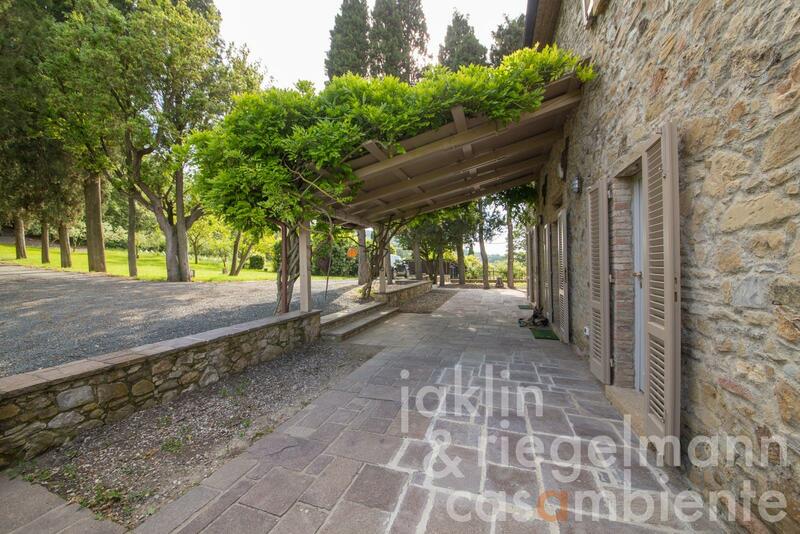 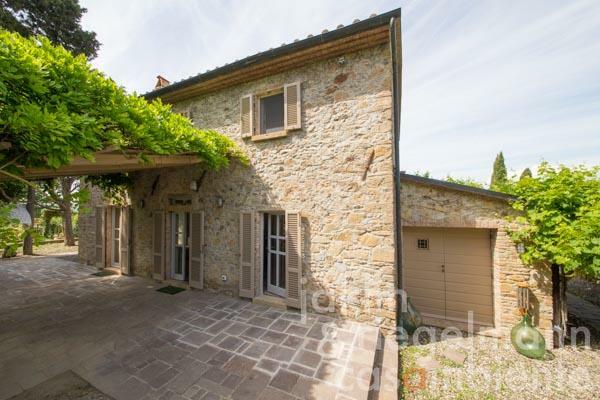 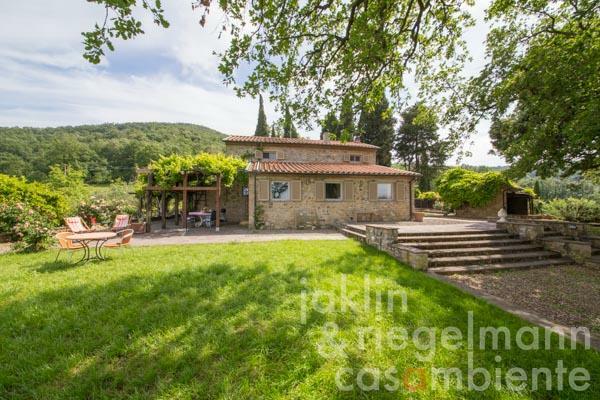 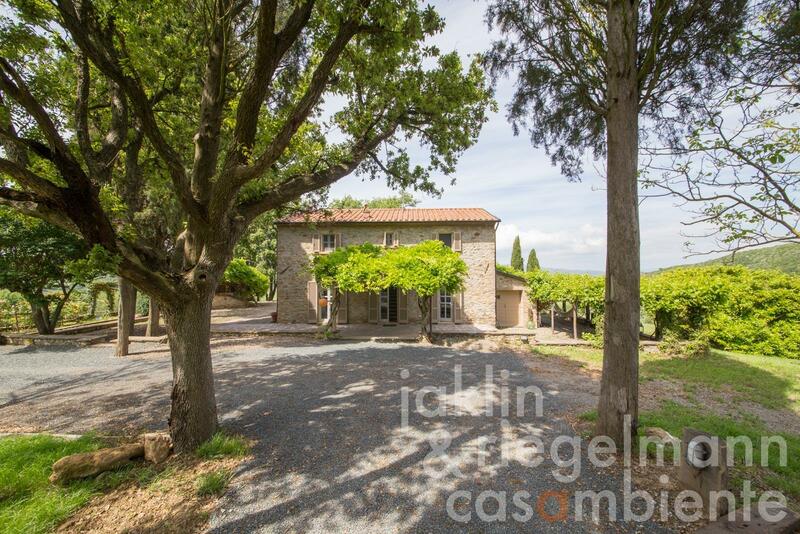 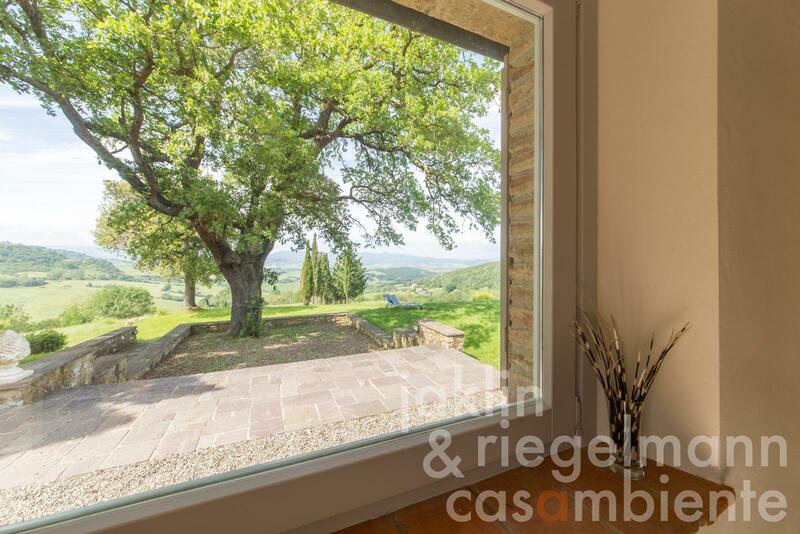 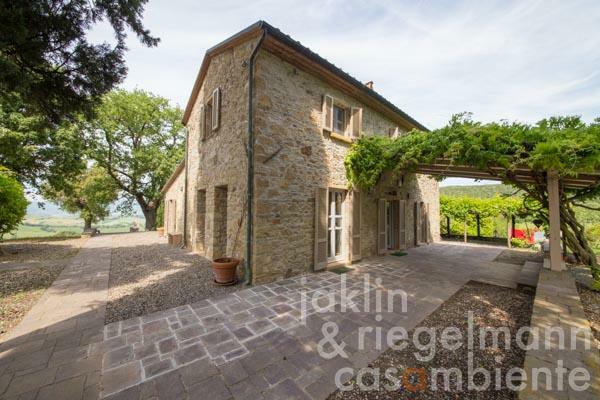 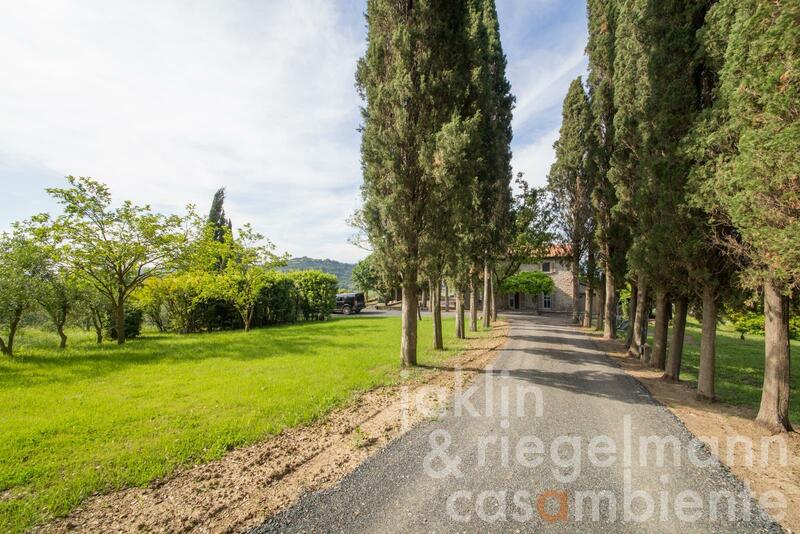 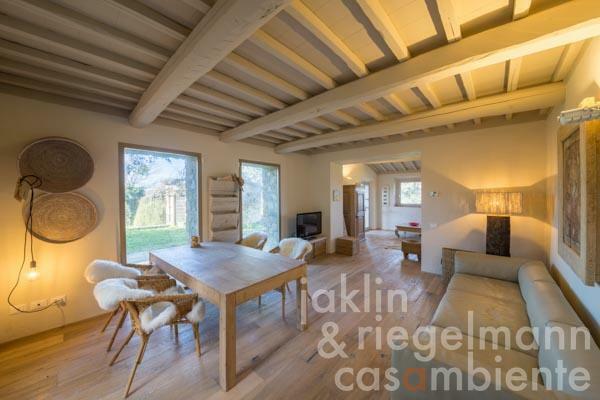 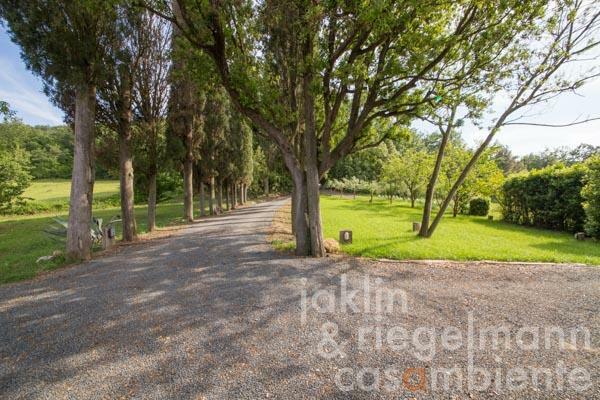 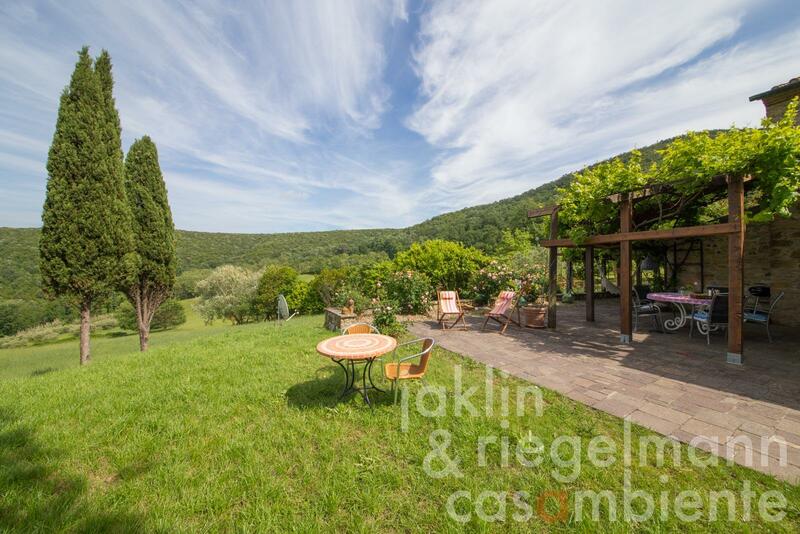 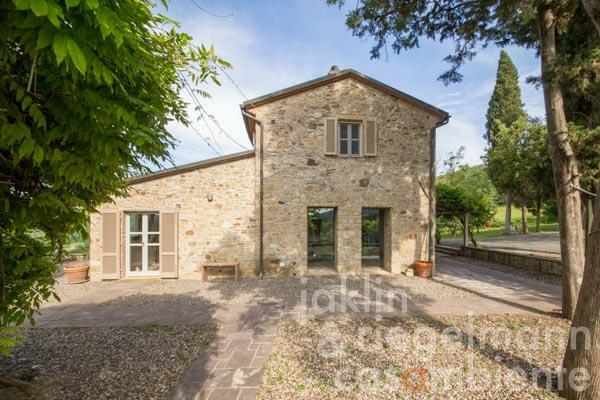 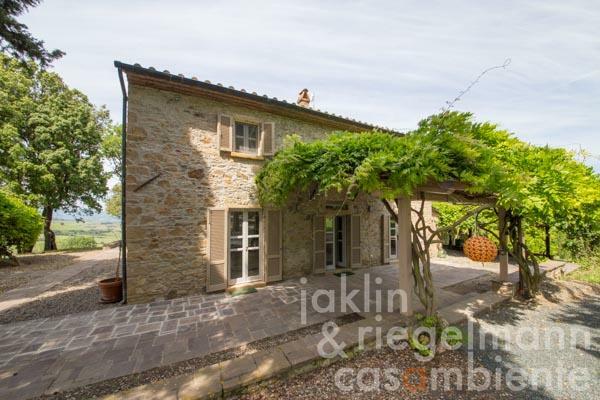 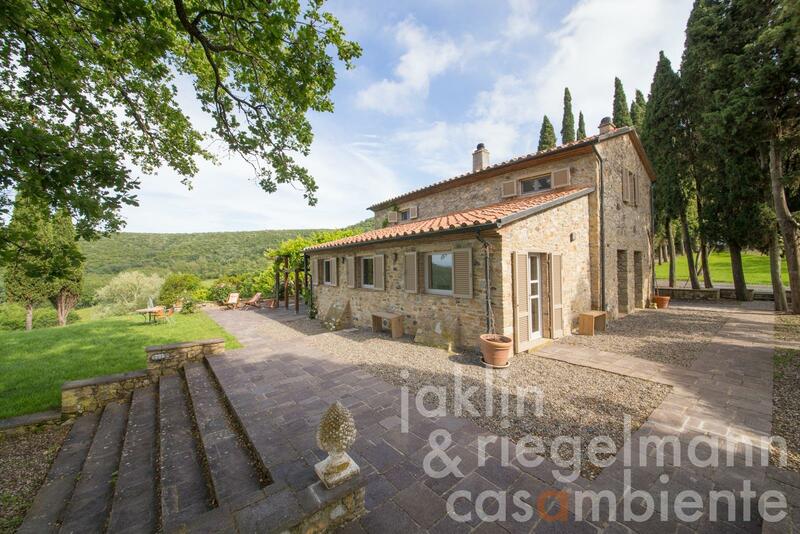 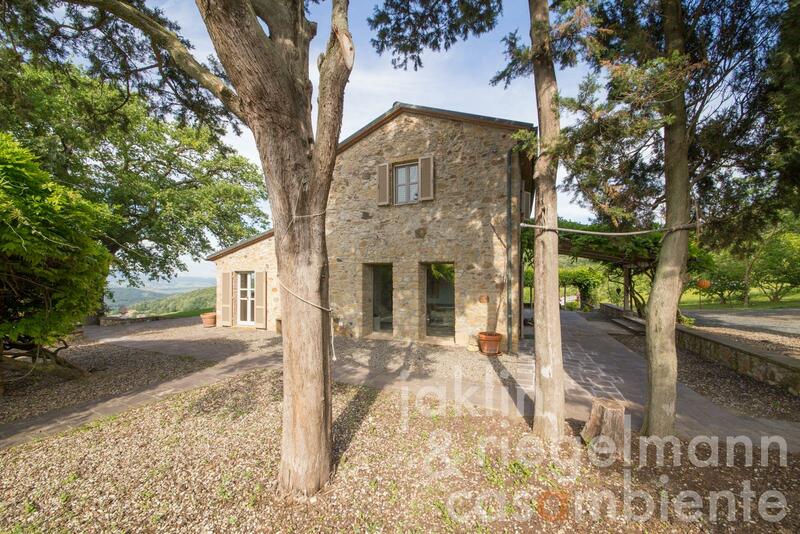 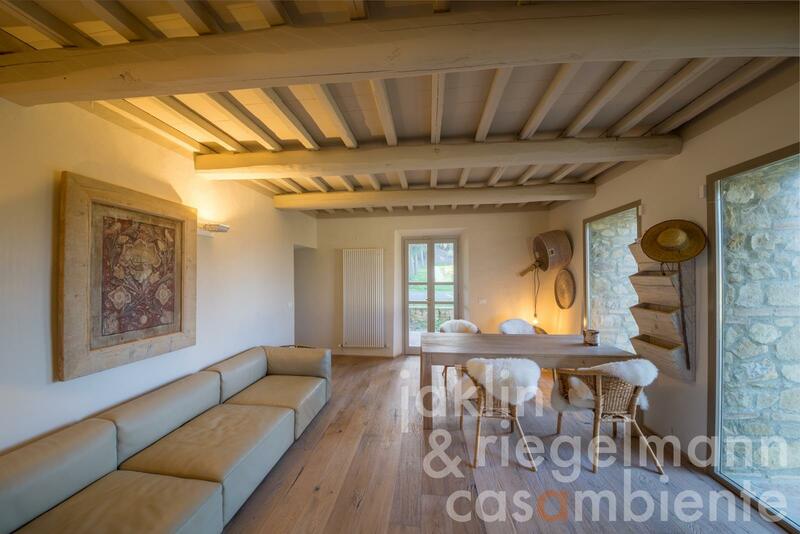 Via a scenic white road one can reach this beautifully situated and undisturbed estate for sale, which offers pure relaxation in a typical Tuscan setting. 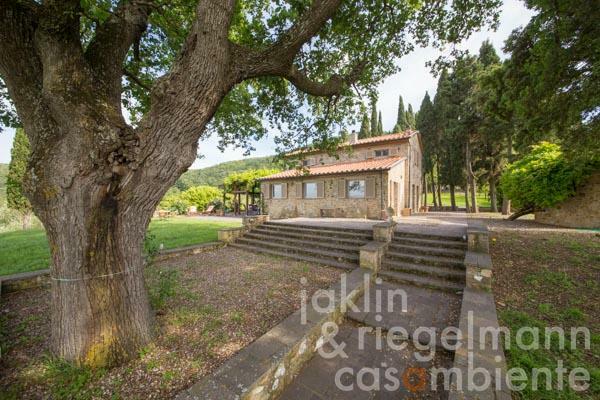 Surrounded by cypresses, olive trees and old oaks, it is situated on a panoramic hillside about 15 minutes from the sea. 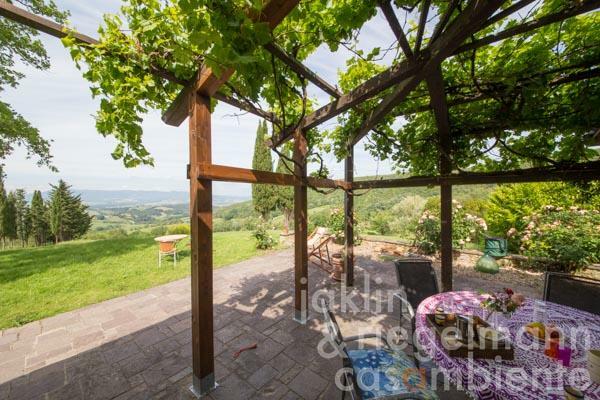 The surrounding towns along the Tuscan coast like Castagneto Carducci, Bolgheri, Casale Marittimo and Montescudaio are within easy reach. 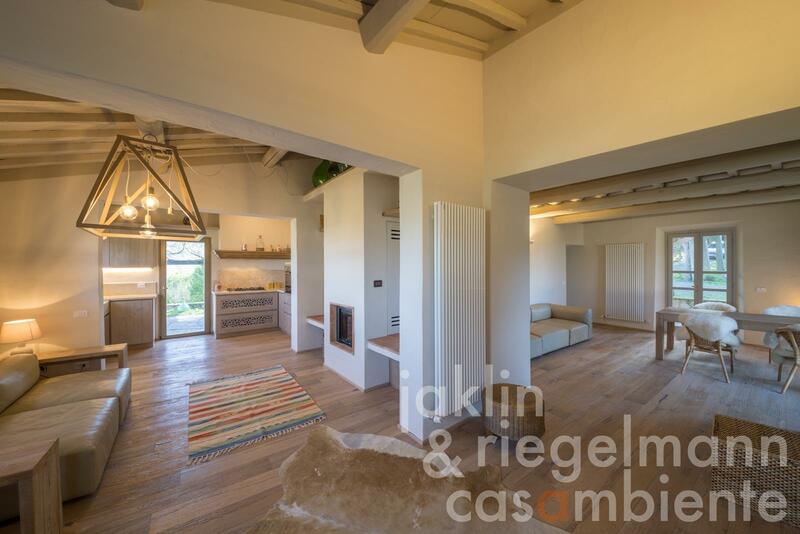 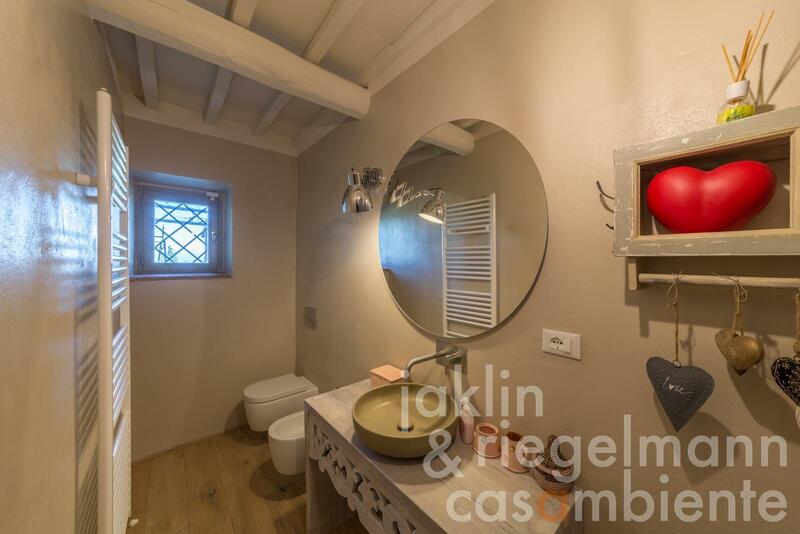 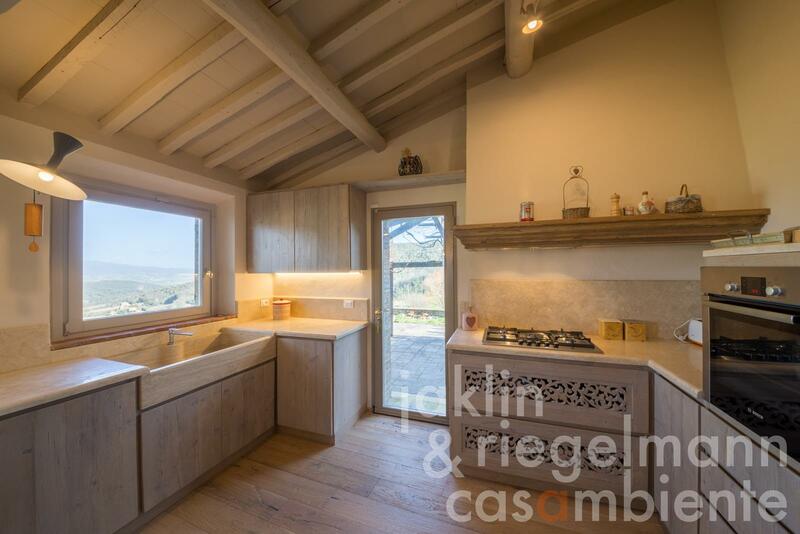 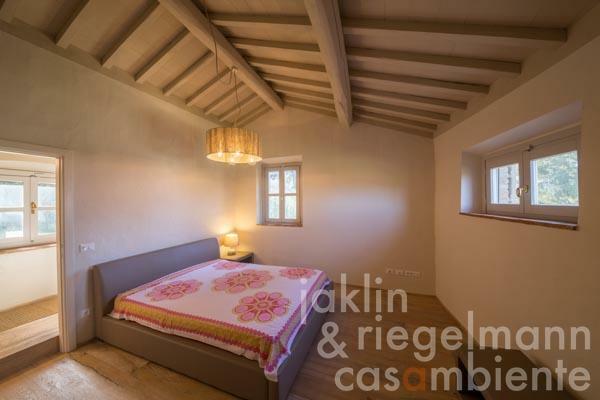 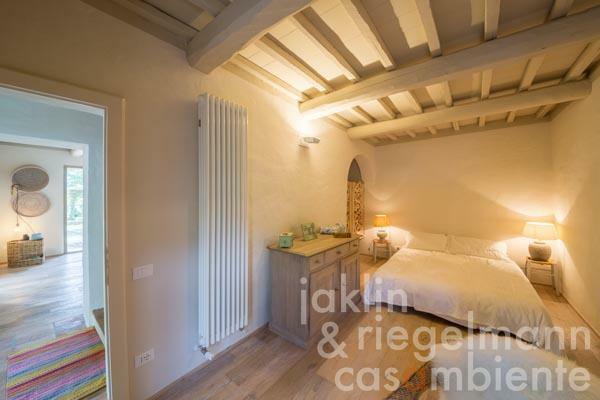 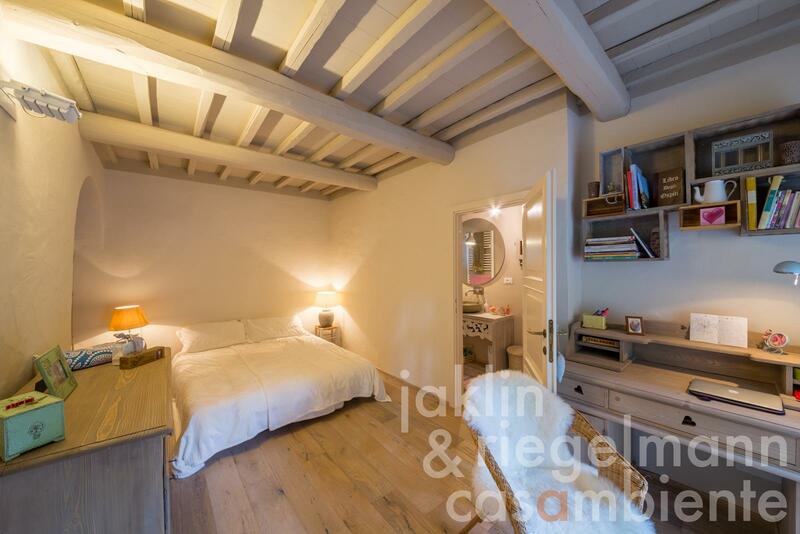 The house was completely restored in 2016 and welcomes the visitor with a clear, very homely style based on natural wood, terracotta and sand-coloured travertine. On the ground floor there is a spacious living-dining room with adjoining kitchen, a studio/bedroom and a bathroom, the upper floor has two bedrooms, which share a bathroom. All rooms on the ground floor have easy access to the various covered or open terraces and green seating areas which surround the house. Large windows and French doors underline the clarity of this light-flooded and cosy home. 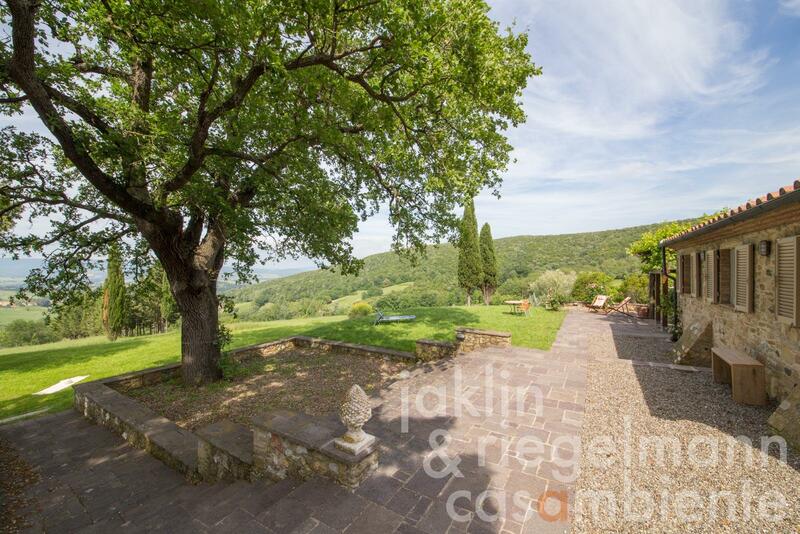 From the house you can reach partly terraced lawns, which are bordered by oaks, laurel, fruit trees and olive trees. There is also a garden with flowerbeds, water basins and wooden sheds. 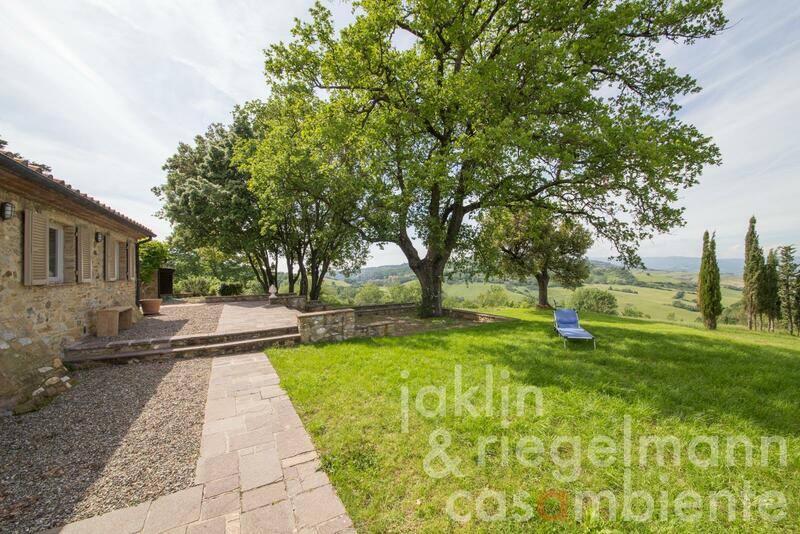 The view extends over the surrounding fields and hills to the nearest villages and small farmsteads. 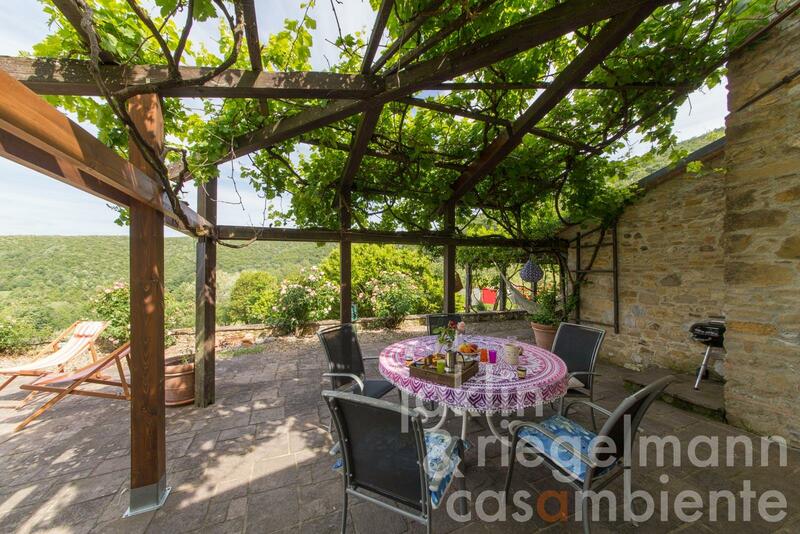 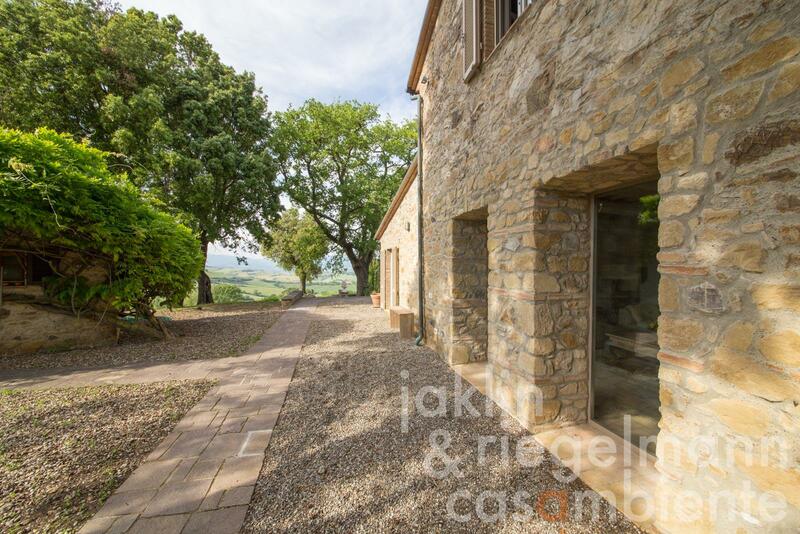 An ideal holiday property, which is also very well suited for renting. 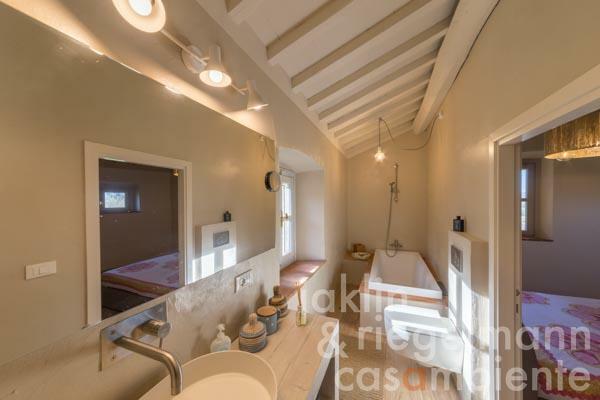 Pisa Airport can be reached in less than one hour. The construction of a pool of max. 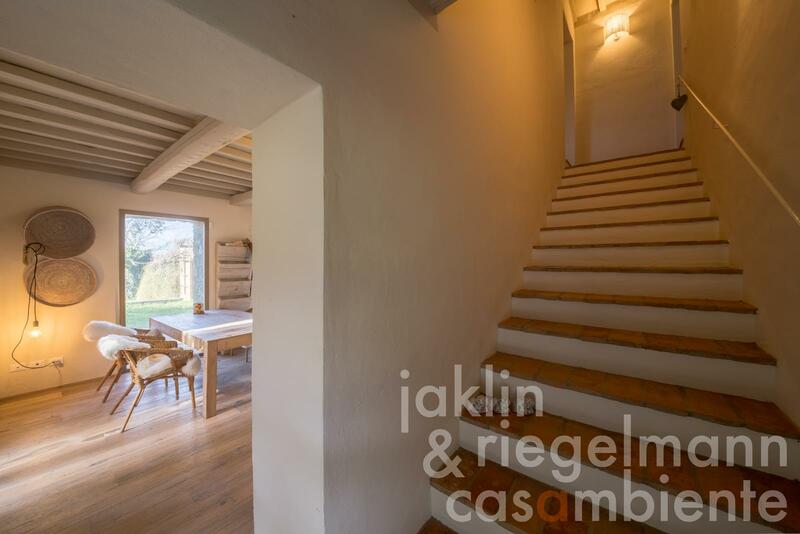 200 m² is possible. Italy, region Tuscany, province Livorno, municipality Cecina. 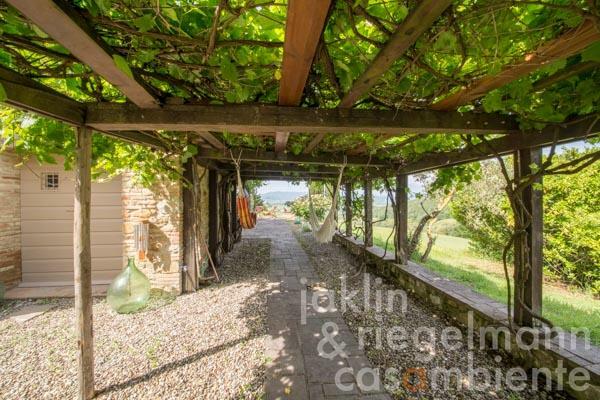 3.99 ha garden and meadows. 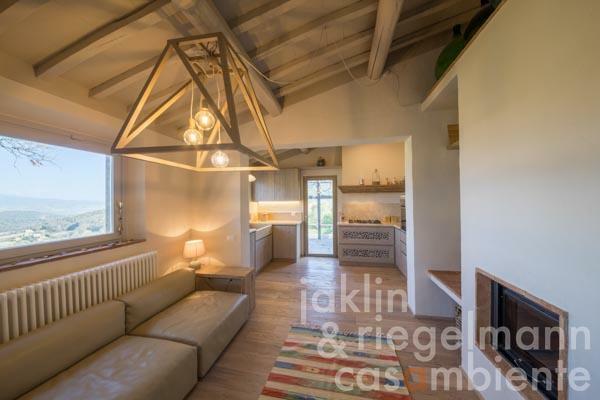 Electricity, own spring water, central heating, fireplace, gas tank, broadband internet access, satellite-TV, alarm system, private parking, terrace, garden.